Portobello mushrooms are one of 38,000 varieties of mushrooms, according to Oregon State University Extension. Although not all mushroom varieties are edible, portobellos are not only good to eat, they provide important nutrients. Portobello mushrooms are circular, flat fungi that can grow to the size of a hamburger patty. Portobellos have a dense, chewy texture and can be grilled or roasted. One portobello mushroom averages 84 grams in weight and contains 18 calories, according to the USDA Nutrient Database. The majority of a portobello's weight is attributable to its water content. One 84 gram portobello contains 77.97 grams of water, which contributes to the mushroom's low calorie content. A large portobello mushroom provides 3.25 grams of carbohydrates, 1.77 grams of protein, 1.1 gram of fiber and 0.29 grams of fat. 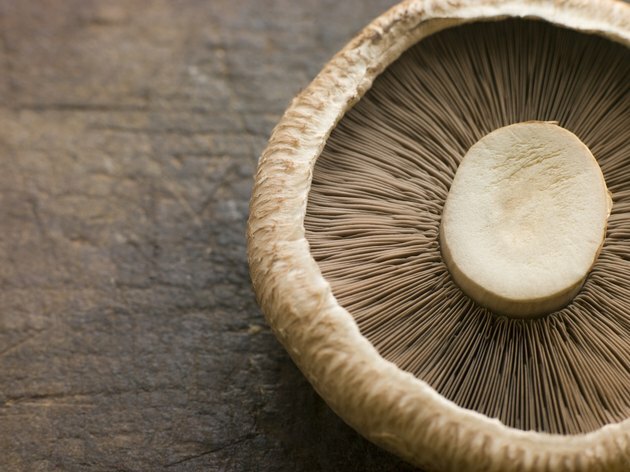 Notably, the portobello contains 306 milligrams of potassium. What Are the Dangers of Eating too Many Mushrooms?